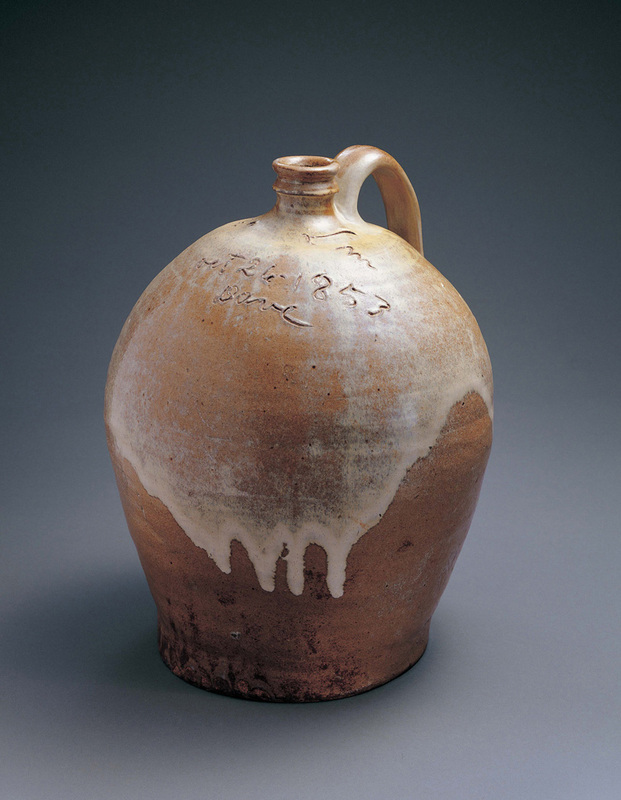 A jug by the Southern slave potter, Dave, is currently on exhibit at the Metropolitan Museum of Art in New York. The jug is in the American Wing of the museum, as part of a show that inaugurates the wing’s spectacular new galleries. The design of the 26 renovated spaces is a reinterpretation of 19th-century Beaux-Arts galleries, complete with coved ceilings and skylights. 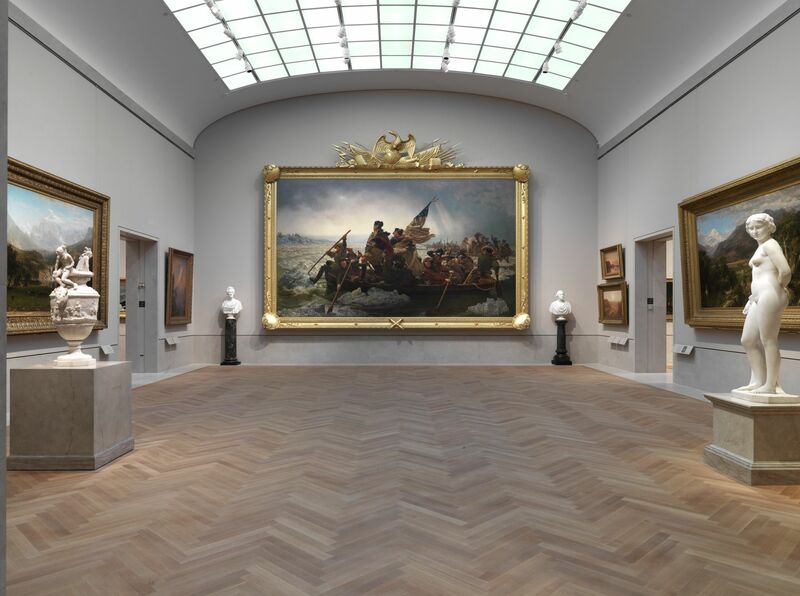 On display are many of the icons of American art: Gilbert Stuart’s portrait of George Washington; Max Schmitt in a Single Scull by Thomas Eakins; and that painting of all paintings, Washington Crossing the Delaware. In re-hanging this enormous work by Emanuel Gottlieb Leutze, the museum commissioned a gilded frame based on one shown in a recently discovered 1864 photograph of the painting. You can see the painting in its new setting at the top of this page. Amid all that grandeur, in an area devoted to ceramics, is Dave’s jug, just over a foot tall. A perfect example of the jug form—ovoid body, abbreviated neck, short strap handle—it is inscribed in Dave’s hand. In the topmost line of the inscription, he has written “Lm,” for “Lewis Miles,” the pottery entrepreneur in Edgefield, South Carolina, who was his owner at the time. On the middle line is the date, October 26, 1853. Below that is his signature, “Dave.” As far as we know, this was his only name until he became a free man after the Civil War. Then, he took the surname, “Drake,” which was the name of his first known owner. The jug is one of 15 masterworks on long-term loan to the Met from the American Folk Art Museum, also in New York. When I told Stacy Hollander, Senior Curator at the Folk Art Museum, that I was writing this post, she made sure I received an image of “the wonderful jug by Dave Drake,” as she described it. Take a close look at the photograph. I think you’ll second her choice of the word “wonderful.” How stylish it appears, with its elegant combination of colors! Nineteenth-century Southern folk pottery was almost always coated with an alkaline glaze, which is a mixture of wood ash, sand, clay, and water. The glaze was developed in the 1810s by the Edgefield pottery manufacturer, Dr. Abner Landrum. It was simple to use: a worker had only to dip a raw, sun-dried pot into a tub of the mixture before firing it. In most examples of Edgefield ware the glaze is a single, mottled color—usually brown or tan or pale green—depending on the individual potter’s firing techniques. Here, though, Dave’s jug is glazed in two distinctly different colors. How did he achieve this? To answer this question, I turned to Steve Ferrell, the gifted potter who lives in Edgefield and carries on the traditions that began in Dave’s day. Steve had been a great help to me when I was writing Carolina Clay, my book on Dave, and I felt sure he could answer any question I might have. I drove into town from my house outside Edgefield, parked my truck on Courthouse Square, and walked a short block to his studio, Old Edgefield Pottery. Steve is generally quite robust, but on this occasion he looked a little pale. He was getting over a strained back, an ailment not uncommon among potters, though, truth be told, he had been lifting a box of books, not a load of clay, when he injured himself. As soon as I showed him the photograph that the museum had sent me, he perked up considerably. “This jug was owned by Frank Fenenga,” he said, “and then by Paul and Sally Hawkins. They gave it to the American Folk Art Museum.” He reached for Jill Koverman’s ground-breaking catalog of Dave’s work, I made this jar…, and opened it to page 26, where there was an image of the pot. Jill used the signed 1853 jug to suggest that an almost identical but unsigned jug of 1821 was also by Dave, turned when he was just 20. Steve gave me a quick, definitive answer. “No,” he said, “the same alkaline glaze mixture created both colors.” The secret, he explained, was that Dave or another pottery worker dipped the jug deeply into the glaze mixture and then immediately afterwards ladled additional glaze over the upper part. The area covered by one layer of glaze would, upon firing, achieve a brownish-tan color; the portion covered by two layers would react differently in the heat of the kiln, becoming cream-colored. Therefore, when it emerged from the furnace, the pot bore a handsome, highly individual, two-toned look: cream over tan. Steve showed me a shard that he had recently found at the site of one of the 19th-century Edgefield potteries, now all gone. It is a portion of the base of a pot, with a thick glaze buildup inside it. The glaze has turned the color of cream. Around its edge, where it thins, is rutile blue. Steve holds the shard in the photo at left. So, a simple container that once held water or perhaps whiskey has led to many questions. Dave began the process in October of 1853 by creating something beautiful and mysterious. Early collectors saved it for us. Two great museums have made it available for us to wonder at. 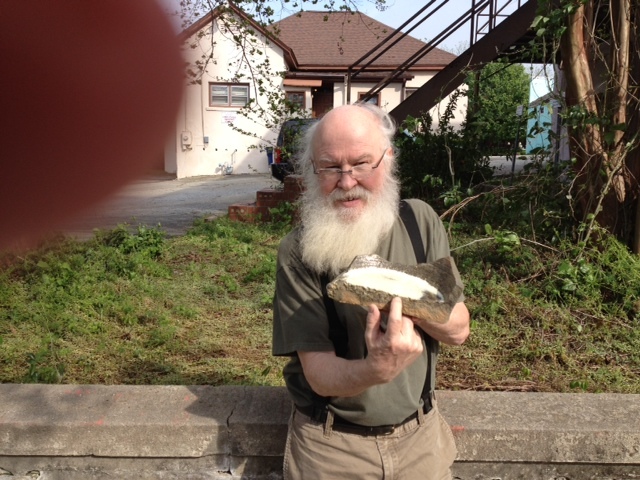 A contemporary Edgefield potter has helped us understand it. It makes me happy to know that Dave’s jug now shares pride of place with the artworks that chronicle our history. When you’re next in New York, go to the Met, make your way to the American Wing, study Dave’s signature, so carefully inscribed on the shoulder of his jug. Then, look at Washington and his men in their silently gliding boat. What an opportunity to sense the whole of American life, from the small, human detail to the pageant of a nation in the making. A friend in Manhattan first sent word that Dave’s work was on exhibit at the Metropolitan. This alert was followed by similar information in a post from Keely Lewis on Facebook at the Savannah River Archaeological Research Program (SRARP) group page. Stacy Hollander and Courtney Wagner at the American Folk Art Museum supplied me with an excellent photograph of the jug, taken by John Parnell. Kraig Smith and Annie Matson at the Met verified the location of the piece and sent me handsome photographs of the American Wing. And Steve Ferrell explained it all. This post was updated on April 18, 2012. Thanks very much, Gary, for sharing your experience with us. Gary’s website address is www.dexterpottery.com. The American Folk Art Museum has a new show at its galleries at 1865 Broadway, just across from Lincoln Center. 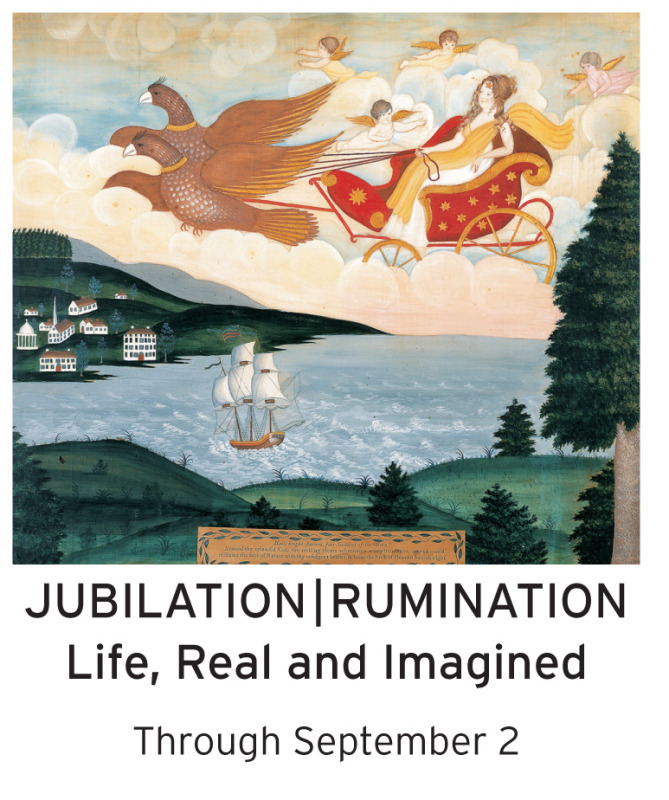 It is entitled “Jubilation/Rumination: Life, Real and Imagined.” It will be up through September 2, 2012. I'M LEONARD TODD, A WRITER. IN THIS BLOG, I'LL BE TALKING ABOUT MY MOST RECENT BOOK, CAROLINA CLAY, AND ABOUT MY NEW PROJECTS. OTHER WRITERS, ALSO FULL OF IDEAS, WILL TAKE PART IN THE CONVERSATION.